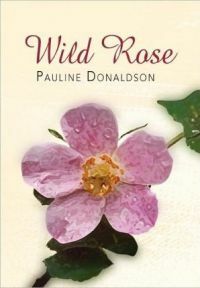 Wild Rose by Pauline Donaldson is the author’s first novel for an adult audience. Set in Yorkshire during the Wars of the Roses, its main character is Alice, a woman who lives alone having escaped from the unwanted attentions of the local squire. When she finds a young child, Cissy, sitting crying and alone beside the body of her mother, her life is completely changed. Alice has no idea where Cissy came from, and takes on the responsibility of raising her, but several years later she makes contact with Cissy’s father, a baron. When I read the summary of Wild Rose, I was attracted by the historical setting – the Wars of the Roses are a time period I am interested in, and I enjoy reading novels set in this period. However, the wars are only a background aspect of this novel, and in all honesty it would only take a few small changes for the novel to be set in any other time. This was a disappointment to me; a stronger use of the historical setting would have made the novel much more interesting. The story of Wild Rose sounds interesting in and of itself, regardless of the historical setting. It never really presents any excitement however, and is very slow and gentle throughout. Even during episodes which in other hands could have been gripping, Donaldson keeps the action light and always presents a sense that everything will work out just hunky-dory for the good guys. The word which I find myself wanting to use to describe Wild Rose is parochial, if such a word can be applied to a novel. It is gentle, inoffensive, and concerned with the day-to-day lives of its characters. The majority of the novel is filled with the everyday activities of Alice and Cissy, first in their remote valley home and later in the baron’s castle. It plods along slowly, never really getting to a point – although after a while you don’t expect it to go anywhere, as it becomes clear from the style and the narrative that it will just continue as it is. The story could also be described as simple and fairy tale-like, as there is never any doubt that the characters will get their happy endings, but simplistic is better applied to the style of the writing. It is abundantly clear that Donaldson is a children’s writer – her prose is straightforward, with many instances which could be lifted straight from a children’s book, as if she forgot who her intended audience was for Wild Rose. Her writing never flows easily, and is rather stilted, both the dialogue and narrative. There are also times when she seems to hit on a term which she likes, and then overuses it – a good example being when several characters take a trip together, and she refers to them as “the party” several times over the space of a few pages. There are also editing issues, particularly grammatical. The most obvious and irritating of these is that quotation marks are all over the place. At first it was easy to overlook missing or misplaced quotation marks, but after a while it became really quite exasperating – there was an instance of this on what felt like every page containing dialogue. Whether this is due to a lack of proofreading or very poor editing, I can’t be sure. Sadly, Wild Rose simply did not cut it for me. While some readers may enjoy its simplicity, mundane story and the lack of thought and effort required to read it, the majority of us expect more from our reading. Many thanks to D’Image for providing a review copy of Wild Rose. No Comments on "Wild Rose"